Serpentine soils host a variety of unique "gems" of wildflowers. One of those plants, found on shallow rocky soils, many time serpentine soils, is the Bristly Jewelflower (Streptanthus glandulosus). It is a native to California and southwestern Oregon. Colors vary from almost black to yellowish-white in a genetically complex group of ten recognized subspecies. Apparently these subspecies have evolved over time as isolated populations ... and thus the phenotypic (visible properties of an organism that are produced by the interaction of the genotype and the environment) differences. 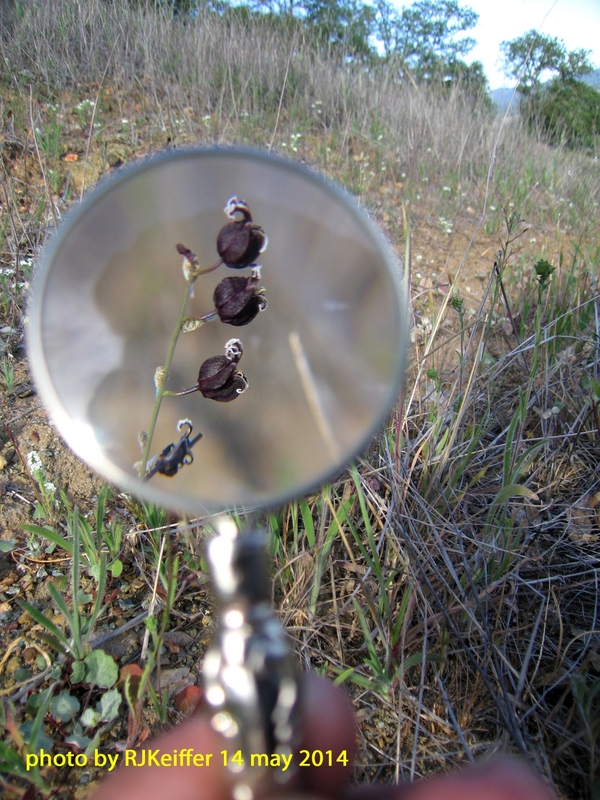 The one photographed below is found in the Hopland, Mendocino County area, and is the subspecies S.g.glandulosus. These flowers look so strange that it is hard to believe it belongs to the family Brassicaceae (Mustard family).